Whether this is your first time at a tradeshow or your 50th, you may be wondering if there is a specific way you should be displaying your products at your booth, and if there is an advantage. 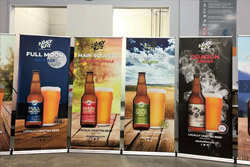 In this article we are going to give you a few tips on displaying your products to make your tradeshow displays Edmonton the best and most effective it can be. Having too many products at your display can end up looking too cluttered and disorganized, and can also make it harder for people to enter your booth. Only bring the most popular, best selling items, or your key products to your display. Many sellers have reported an increase in results after downsizing their product numbers. Having a great and eye catching demonstration is key for stopping the traffic on the tradeshow floor. It engages prospects and leaves a lasting impression making them want to return for more or purchase the product right then and there. It can sometimes be tricky to draw attention to smaller products at a tradeshow. Using some great graphics, popup displays Edmonton, or a demo showing the small product in use can bring some life to the otherwise harder to notice products. If you are showcasing products at your tradeshow display Edmonton then you will want to make sure they are the star of the show. You can have spotlights shining down on the product, uplighting on your shelves or display cases, or many lights throughout your entire booth. 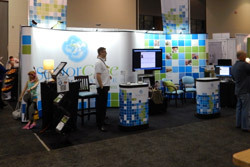 These are just a few tips to better display your products at your next tradeshow. For more tips and information contact Display Design for more information today!